· Copy and paste the italicized text into the top of your blog post. · Finally, go read/comment on/link to and share other participants posts! Hello Everyone, welcome. Today I am participating in a blogging a challenge (see the text above), and invite you to do the same if the subject matter is of relevance and interest to you. This challenge was created in collaboration with the Dork Ages Blog (See hyperlink above). Enjoy. I have been playing roleplay games for over half my life. I was a late starter compared to some of my friends. One thing I learned early on is that roleplay games, like any form of literature (yes, I said literature) suffers from cliche and tropes. The dying wizard is probably one of my favourites, though probably not the absolute favourite. That one is not DnD related, in fact it is 80s television related, where everything is made of explodium…Anyway, back on topic. 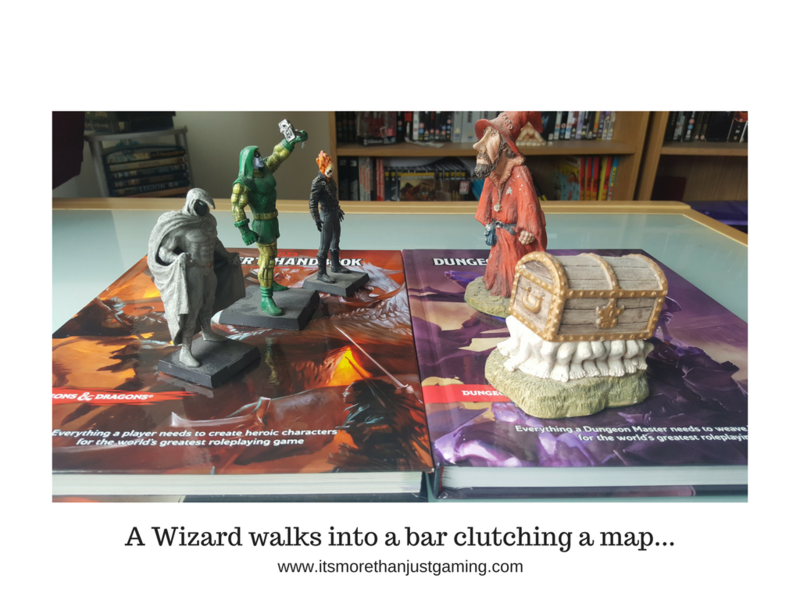 A Wizard Walks into a bar… represents, to me at least, a method of pulling a roleplay party together at the start of an adventure. And some would argue it is actually quite a lazy way to do it. I suppose technically, that is true. However, it is lacking context. And something one of my various writing tutors once told me. Cliches are cliches because they work. The only problem with them is that they are overused. I thought I would talk a bit about starting roleplay campaigns. I guess it always comes back to why we are playing a specific game. Are we writing a story with our characters, or are we members of a gaming group that simply want to play the adventure one of the group has kindly written? Both are perfectly reasonable answers. And the first clue as to what the players want comes down to character creation. I would suggest that if players are more interested in simply playing the adventure, which is absolutely fine, and don’t really have a lot of time for the intricacies of a story then you will probably see a table of people creating characters in isolation. Is this problematic? No, if you are simply wanting to play the adventure then that is fine where everyone has a common goal – the treasure hoard or slaying the beast. Maybe the motivations are different but the solutions are in the same place. The thing is, when created in isolation, it is possible to have lawful neutral paladins created at the same time as chaotic neutral gnomish mages, or even neutral rogues or evil aligned fighters. And the games master has to look at this mismatch and think, “How on earth are they coming together as a group? Why are they staying together?” I have surfed through various Facebook community groups and encountered posts where the Wizard walking into a bar trope is deemed, by some, as lazy. But, ask yourself – if players are creating characters that they want to play isolated from one another, is it fair to ask the Games Master to create stories just to bring the players’ characters together? If you, as a player, are wanting a stronger start with a more realistic, organic, formation of your party then I think there is a bit of give and take. Bluntly, success of the game is the responsibility of everyone at the table. Yes, the Games Master has to put in the effort with the story, but player involvement and agency are key. So, if you want a group that works then you probably don’t want any combination of characters that will trigger one another. And by trigger, I mean something akin to sending the Paladin on a righteous crusade against another character because the character did something that violates the Paladin’s moral code. There is an opportunity, prior to character creation, for discussion about the rough ideas for player characters to see if there are any obvious stumbling blocks (like the aforementioned Paladin/Probably Rogue combo). Players aren’t really required to share everything about their characters, some mystery is a good thing as it gives stuff to talk about and uncover during play. However it is good practice to at least know that your party will work together. It is also useful for the GM to know what the players are making so they can offer suggestions. For instance when your party is lacking something vital. This discussion will then give the GM enough information that they may be able to bring the characters togeether, based on backstory rather than GM Fiat. Other ways to bring a party together. The players start as prisoners in a cell, on a wagon or aboard ship. It works for Skyrim (and I believe all the Elder Scrolls) as it encourages a bond of cooperation. Players must work together to escape their current predicament. Perhaps they have been framed? Perhaps they are guilty, and need the help of some guild or other to evade the law and that guild will only help if the players do a job for them. So now the players have to do a job, whilst evading detection. I think that might be quite a fun game to run. The Players are in the same town or city that comes under attack. They are unable to escape so must fight to defend themselves. I quite like this idea though have not had the opportunity to use it. I recall the opening chapter of Throne of Baal, the Baldur’s Gate 2 expansion doing this story. And it was fun! I think it would be a great way to start an action heavy adventure just throwing characters into the deep end and forcing them into a situation where they end up fighting side by side against an invading force. Maybe there are a couple of NPCs there that some of the characters bond with that you can kill to get them personally invested? The Players are hunted. The players find themselves in a situation where they are being hunted, and must cooperate to survive and figure out what is going on. I quite like this, though there needs to be a valid reason for all of the players to be hunted. The players don’t need to know the reason, part of the game should be about figuring it out. I would say that I have used this once on the wrong player, and it did backfire. The character woke up in unfamiliar surroundings, having done stuff that was hunt worthy, as a result of choices they had made. And they were hunted by authorities. They didn’t enjoy the game as it wasn’t what they were used to, they preferred a more straightforward narrative. So, use with care. The Players have a common friend/associate/creditor who summons them to do a job. This isn’t that different from a wizard walking into a bar. It is almost the equivalent of giving an NPC an Exclamation Mark above their head, which is fine. So long as the adventure doesn’t revolve around the players harvesting rat tail to make burgers or something. And of course, if your players have detailed backgrounds maybe there are strands that the GM can weave together. With those strands woven, perhaps you can create a bond between a couple of the characters that can be built on. So, those are my thoughts on a Wizard Walking into a Bar. I hope this has been of interest to you. I invite you to take up this challenge and see what you come up with. If you do, don’t forget to link to me and comment below so folks can find your post!